This is the subsection which houses the characters from the VayneLine story, this section only refers to those characters from that specific book, and does not include characters that are cross-overs from other stories where they are the main character. VayneLine follows three major groups: Gauge, Leiger and Havok. Additionally characters are listed separately. 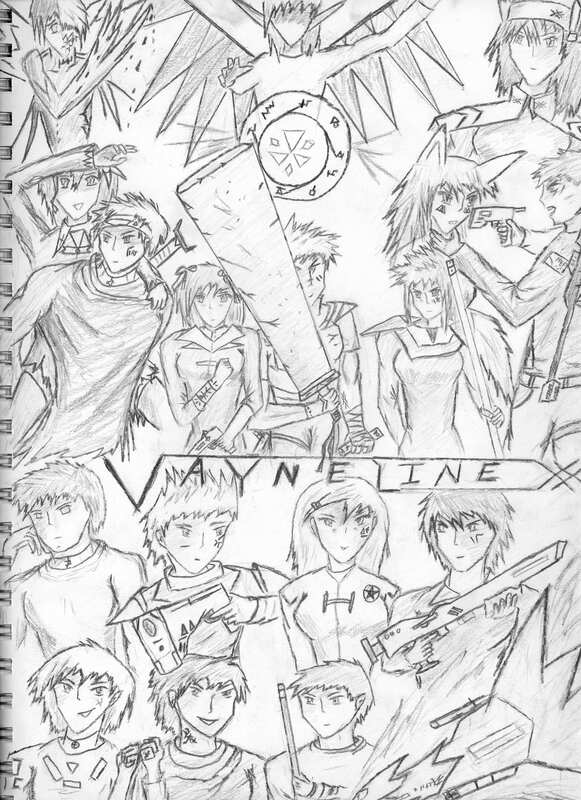 Fan art cover of Vayneline. From top left, ‘Mutated figure’, ‘True Form’, ‘Dream Figure’. 2nd row: Miranda, Leiger, Arianna, Gauge, Fade, Ran, Havok. 3rd row: Rex, Felix, Roza, Reno. 4th row: Sky, Eirik, Billy, Blue Dragoon. Fade – A ex-scientist who is saved by Gauge, she is very intelligent and quite skilled in combat due to her design as a weapon officer. Star Priestess Arianna – Esoteric Priestess who convinces Gauge to take a powerful artifact. Sky – Slightly effeminate athlete who was once rich. Spiritual. Felix – Mostly silent solider for hire, has been with the group a while. Leitra – Leiger’s comrade who was thought dead or missing. This section will be expanded later as more characters are added.